15 14/07/2019 25/07/2019 £679.15 On sale! Gifted with a staggering abundance of flavourful food, fascinating culture, untouched nature, and disarmingly friendly people, Vietnam has more than earned its rep as one of the world’s most popular travel destinations. This fun-focused family trip packs as much of the good stuff into 12 days as humanly possible – including cruising Halong Bay, exploring the Imperial Citadel, museum visits, and even a boat trip to a floating market – yet still offers more than enough time to relax. Don’t forget to pack your smile; you’ll be needing it often here. Continue on the cruise of Halong Bay to Man's Head Island and Tortoise Island. Visit Luon cave by small bamboo boat. 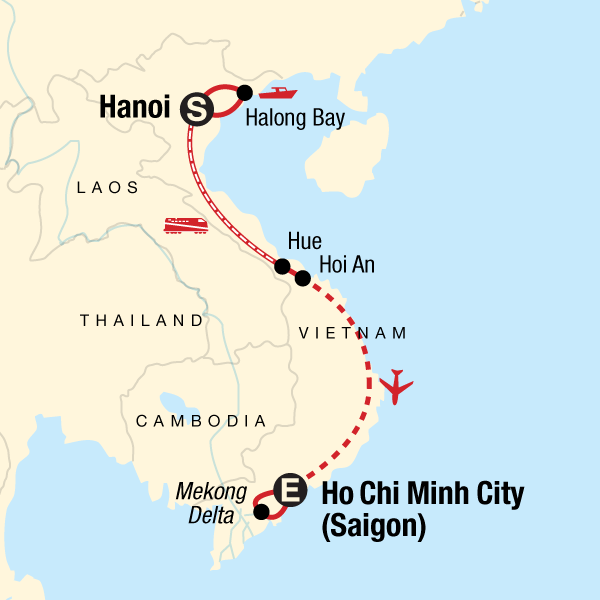 Overnight train to Hue. Guided tour of the Imperial Citadel. Opt to visit to the Royal Tombs and Tien Mu Pagoda. Or, experience the city from the back of a motorbike - like the locals do - when you pre-book the optional Hue Motorbike Tour on the checkout page (riders must be at least 12 years old).